In the past couple of weeks a lot has been made about street-artist Banksy’s documentary Exit Through the Gift Shop. At the center of this filmThierry Guetta, a documentarian (of-a-sort) that has now gone on to fame as a street artist himself, using the name Mr. Brainwash. For those who haven’t seen it the world of street-art is the backdrop for the film, but the central story revolves around Guetta’s transformation from a somewhat-lovable goof with a camera to a full-fledged, sought-after Artist. All of this, despite the fact that his art is awful, derivative, meaningless, slop filled with noisy “symbolism” signifying nothing. Don’t believe me: Exhibit 1, Exhibit 2, and Exhibit 3. Since the film premiered at Sundance a number of critics and viewers have questioned whether or not Thierry Guetta actually exists. There’s a creeping suspicion that he is somehow himself a prank, that Banksy and Shepard Fairey have constructed him. Well, this ties in nicely with the episode of Sparrow Songs we’re currently working on which happens to be about The Truth, or rather people who believe they have the truth and feel the need to share it with others. This, oddly, is exactly how I feel every time I read a piece questioning the veracity of Thierry Guetta’s existence. You see, a year and a half ago I got a phone call from a friend looking for someone to help out on a potential documentary about Shepard Fairey. It was in the early stages but from what they said, they had tons and tons of unbelievable footage of Shepard bombing various cities all of shot by a crazy Frenchmen, named Thierry. I was finishing up my thesis film for UCLA, needed money and this seemed like a good fit. I was told that the job would entail logging the footage and sorting it. “Okay, not too bad,” I thought. Shepard in hardware store. (6 mins). Shepard walking down street (3 mins). Camera left rolling on table while people eat dinner (42 mins). Camera still left rolling on table while people finish dinner (33 mins). Camera blocked by dessert tray (6 mins). Walking down street in New York (12mins). Thierry talks to woman (5 mins). Shepard pastes New York water tower (20 seconds). When you spend that much time with someone’s footage it feels like you’re spending time with them. You see the world the way they saw it and you hear their questions, frustrations and observations. As bad as the footage was Thierry’s personality came through in the tapes — he speaks in non-sequiters, doesn’t respect people’s personal space and is distracted by all things equally. It was maddening. In fact, if you want to replicate Thierry’s footage all you need to do is strap a camera to the hood of a muscle car, remove the steering wheel, hit record and drop a brick on the gas pedal. All of this is to say that in the time I spent with Thierry’s footage I found that he is without a doubt absolutely fundamentally lacking any self-awareness. Which is the exact reason people seem to think that he’s a character constructed by Banksy and Shepard. How could anyone possibly stand behind the work he does? How could someone keep a straight face while standing next to a painting of Larry King in a Warhol Marilyn wig? How could people believe him? I don’t know, in fact I have no idea, but I know that Thierry Guetta is real because I spent weeks and weeks wishing he weren’t. I did some snooping. Thierry is a real person. Does realestate as well as sells clothing with his brothers. Look up 3E Productions as well as DUST productions. I don’t know if he is the same “character” that is in the movie, but there is a Thierry Guetta. ah, interesting. good story. fantastic film. I loved the movie, but when thierry started copying banksy and shep’s art completely I just got so annoyed. He wasn’t bad at the start, I enjoyed finding out about his life and how he got into filming graffiti, but towards the end he became such a prick, I just wanted to yell at him. It’s simply Supply & Demand man. Do you know if Thierry’s documentary (his original cut) is available ? I’d love to see it. Also, what has happened to the raw footage now? That would be an incredible resource for projects I have in developing film/music out of mountains of unstructured raw footage/audio. I really enjoyed this blog post, but then read the comments. Mike Casey, are you insane? Did you not see the bit about thousand of hours of unusable footage? And their effect on mental health? Sparrow Songs, I don’t know if I completely believe that this documentary is real, but you’re very convincing.. I don´t know, it all seems so Banksy-made…. Too Cute with Guettta Brothers. Cannot locate where it is carried. Can you help. There is no doubt that Thierry Guetta is a real person and that he’s filmed all this footage, but the question here is : is Mr Brainwash really his own project? I am a professional film editor. While this story does sound like it was written by an actual editor, I don’t believe it for a second. This story is another example of clearly fabricated “evidence” that the film is real. Good film, though a little slow. Nice, I just came across this after writing my own blog on WP which verifies some footage was shot at the time claimed. And thanks for the footage work, better you than me! I maintain that Thierry is indeed a real person. Banksy and Thierry are two totally different, separate human beings. Hate to break it to everyone, but Thierry Guetta IS Banksy. Right in front of all of you – in plain sight. He did such a great job that nobody even seems to even notice. i just dont think most people think its real becasue of the art is question… how can anyone buy something from mbw.. and bankey is making a statment on that. after all we all know someone who belives there work is the best— american idol anyone>? 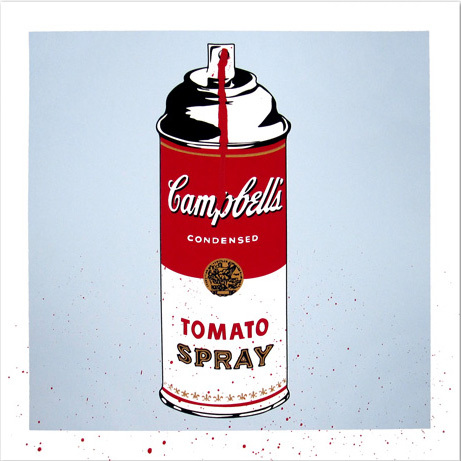 maybe mr brainwash is just the willam hung of the art world. I can’t get my head around the fact that people even considere(d) Thierry Guetta to be “FAKE”. He is just mental, that’s all. I saw it and I didn’t think it was a prank at all. Hi. Which clothing store in LA does he own? Interesting film, don’t believe it for one minute. Did I Make a Campaign Ad?